Larry is a monthly columnist, appearing on the third week of each month. 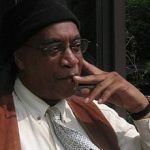 Pinkney was convicted of assault and burglary charges in the United States in 1973, accusations which he denied. Before sentencing, he fled to Europe and then to Canada, intending to apply for political asylum. In Vancouver, he was convicted in 1976 of attempted extortion and sentenced to a five-year prison term. While in prison, he filed a case with the United Nations Human Rights Committee in Geneva, which ruled that the Canadian government had violated Pinkney’s rights through lengthy delays in providing court documents needed to file an appeal. Pinkney served his full five-year sentence in a Canadian prison.